Starting February 29, 2016, McDonald's will be running a two for $5 mix-and-match deal called the McPick 2 for $5. The selection for the deal includes a number of classic McDonald's menu items, including the Big Mac, Filet-O-Fish, Quarter Pounder with Cheese, and 10-piece Chicken McNuggets. It's available nationwide for a limited time at participating McDonald's restaurants and follows the recently discontinued McPick 2 for $2 deal (it was discontinued nationally but can still be found at select locations). 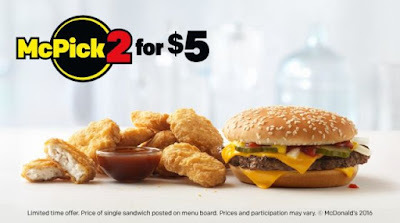 The McPick 2 for $5 is very similar to Burger King's long-running 2 for $5 mix-n-match deal, which is frequently updated with new burgers/sandwiches to go along with a classic selection. When queried about the long-term outlook for the McPick 2 deals, I was told by a McDonald's representative, "The McPick menu is grounded in what our customers are looking for, choice and flexibility, which means it definitely has long term potential as we continue to look for ways to give our customers both great tasting food and value." So maybe a McPick 2 for $4 is next?